February 24, 2016 / Steve M.
This one potentially is only of interest to me as it has no illustrations, but does belong within the Vidal group, of editions Couvre-Feu at al. 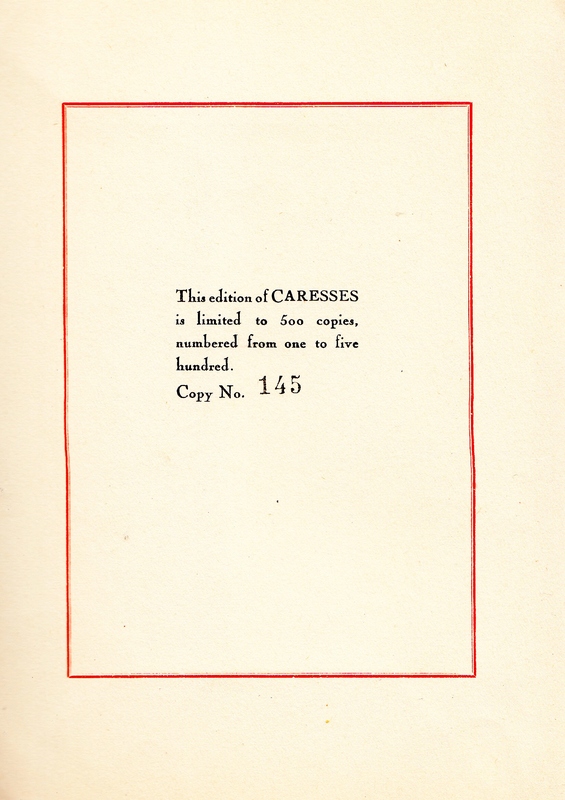 Although this title has no publisher, printer or date details, and therefore is effectively a clandestine edition. The French version appears to be one of the more common titles from this publisher, but this the English edition appears quite rare. This copy has the page preceding the title page cut out, the half title is present, and the person I purchased it from speculated that it might have been an illustration, but as there is no reference to any frontispiece in the French edition I doubt that this is the case. It could of course been the publishers detail and a decision was taken to excise it. If anyone else has a copy of this edition I would be curious to know what the missing page contains. The bibliographical information below is from “Les éditions du Couvre-Feu”, published by éditions Astarté ,2013 where it can be found on page 150. 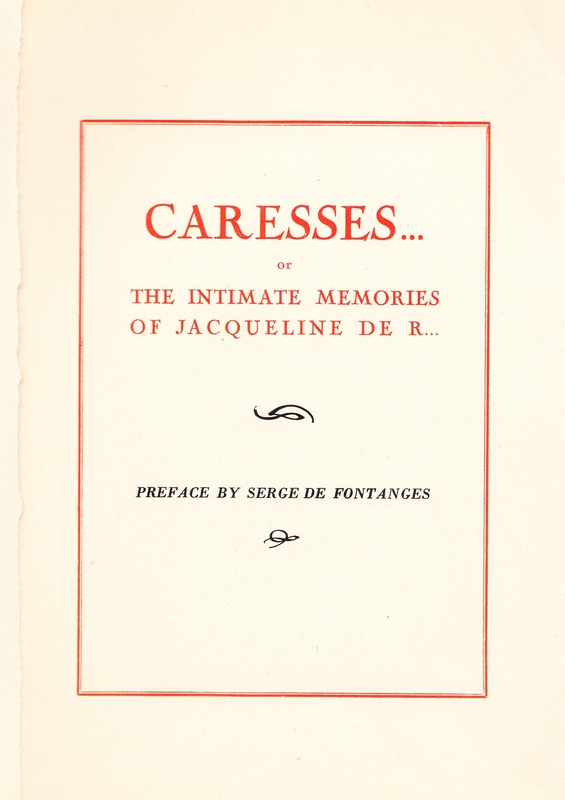 Anon; Caresses………..or The Intimate Memoires of Jacqueline R. n.p. n.d ( Editions d’Antin? 1937? 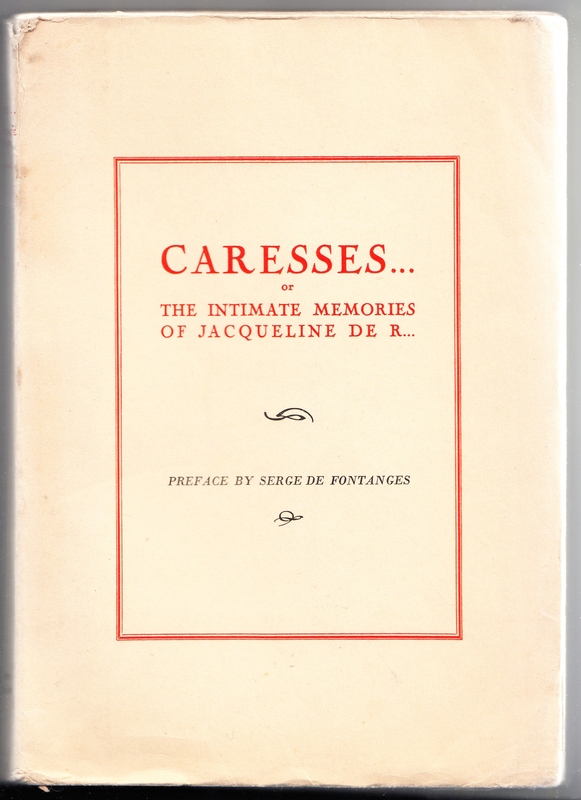 ), with an preface by Serge de Fontanges, in original French wraps over plain card covers, prited in red and black, Price of 150 Frs on spine, 201 uncut pages, text within a red box on each page. Appears to be a rather well written story of lesbian sexual encounters, and may well have been anonymised, because of its explicit content.